While their slogan is inviting, "Missouri's Most Scenic Winery" did not instill confidence in their wine. Until I visited. I went for the same reason I visit other wineries when I travel to lesser known wine regions, the presence of dry wines and those produced locally. Give me your production, not something grown in California that you approved to be bottled. The current owner and winemaker, Tony Kooyumjian, bought the place in 1998. The previous owner started the winery in 1970. 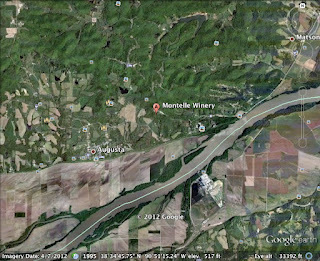 The winery is located in August, Missouri west of St. Louis. The region was designated the first American Viticultural Area (AVA) in 1980. Napa Valley followed about eight months later! I will not recount my visit, as it was a number of years ago but their cynthiana impressed me enough to buy a bottle and age it. The back label clearly states, "Also known as Norton," so we know where they stand. However, they omit a 'd' for their perch (see above), making it "Osage Ride," instead of Ridge, so perhaps the rest should be taken with a grain of salt as well. The current release still features cynthiana on the label but is listed as "Norton 'Cynthiana'" on their website. Love the screwcap, thanks! There is some slight browning on the edge of the wine but nothing to be concerned over. The core remains a deep ruby, far from opaque but not light either. Some wood and alcohol on the nose with hints of that older, brickish aroma of slightly dried fruit that older wines exhibit. Some blueberry, maybe blackberry hints but not as sweet as blackberry can be. The tartness of blueberry dominates. Subtle tannins and puckering acidity remains, tingling the tongue before becoming juicy and fragrant again. Delicate earth aromas emerge and remind me eating blueberries right off the ground hugging vines in Maine. No noticeable oak influence appears, the wine is very fruit driven and offers a great balance between young juicy fruit and the older, drier style.